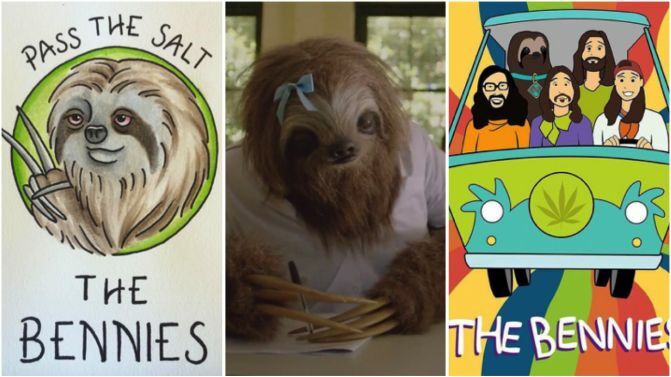 In a move of pure genius, Melbourne’s 420-friendly “bong lords” The Bennies have turned the advertising failure phenomenon that is Stoner Sloth into a t-shirt design competition which is already seeing some pretty dope Sloth-inspired entries. Stoner Sloth is the sluggish face of a new anti-marijuana campaign (below) launched by The NSW Department of Premier and Cabinet and NSW Health, which is being ridiculed across social media. The campaign, which is now the subject of The Bennies’ latest escapade, sees Stoner Sloth failing at school and struggling to pass the salt at the dinner table, all ’cause he’s blazed. Posting to Facebook to introduce their competition, The Bennies say, “We think ‪#‎stonersloth‬ is a mad chiller and seems to be getting a hard time this week, so, we’re running a tee shirt comp!! There are already a few Stoner Sloth t-shirts on the market, but these entries are something else. Whoever wins the competition is sure to make Stoner Sloth feel proud to be the centre of attention, even if he doesn’t realise it. To enter The Bennies’ Stoner Sloth t-shirt competition, share your design on social media using both the #stonersloth and #thebennies hashtags before 5pm on Christmas eve. But before you do, relive all of Stoner Sloth’s #blazed shenanigans, below.